The continued advancement of technology has made it easier to get more done in fewer minutes. 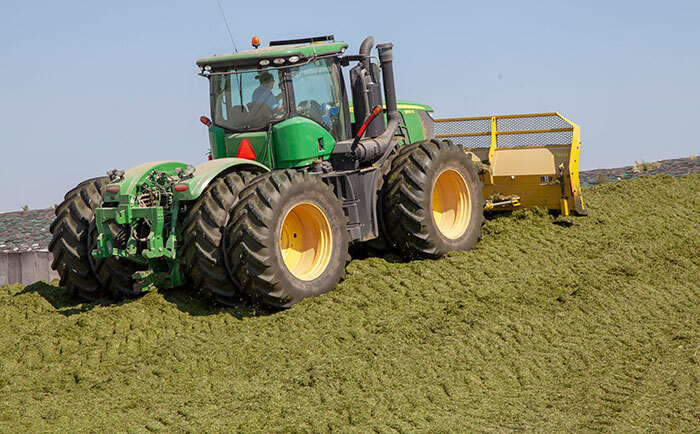 But the process of packing silage piles is a task that needs ample time to complete, notes Nathan Hmicek, a forage products specialist for Vita Plus. According to Hmicek, recent density analyses completed by Vita Plus have shown that approximately 25 percent of the silage bunkers surveyed had packing densities below the industry minimum of 15 pounds per cubic foot. With insufficient packing density, the risk for dry matter and profit loss accelerates. “Packing densities that don’t hit at least 15 pounds per cubic foot are subject to a dry matter loss greater than 15 percent,” Hmicek says in his recent post on the Vita Plus blog. If silage is valued at $40 per ton on an as-fed basis, a difference of $1.50 less in losses is seen when comparing a packing density of 17 pounds per cubic foot to 13 pounds. If you produce 5,000 tons of silage per year, $7,500 worth of forage saved instead of lost in spoilage. Although the minimum goal is 15 pounds per cubic foot, Hmicek suggests aiming for 17 to 20 pounds per cubic foot. • Know the packing tractor weight. Eight hundred to 1,000 pounds of packing weight are needed for every ton of silage delivered per hour. • Know the timing of when loads will be coming from the field. If a 17-ton load arrives every 10 minutes, you will be packing 102 tons per hour, requiring 81,600 to 102,000 pounds of packing weight. • Packing needs to be happening constantly. A packing tractor needs to be on the pile throughout the time trucks are unloading. • Thinner is better. Packing in 6- to 8-inch layers will ensure you get enough weight on each layer to reach the targeted density. • Minimize mud from tires. Introducing mud in the pile raises the chance of contaminants and toxins. • Use a good packing technique. Drive over the pile in several directions and avoid changing directions to ensure feed is not dug up. • Take one last drive. A final pass over the pile will smooth out the surface to limit the amount of oxygen in the upper surface. Other factors such as chop length or moisture are also key factors in packing density. Using proven inoculants and oxygen barriers will also help enhance the quality of your silage by reducing spoilage and oxygen infiltration. A clean silage face will help maintain the established density, unlike roughly pulling feed down. So, what do you do if you already have a low-density pile? To compensate for the lack of density, start feeding more inches per day. Be ready to accommodate for a quickly disappearing pile and elevated dry matter loss. Work with your consultant and consider purchasing extra feed to manage feed inventory. Spoilage might become a problem due to higher oxygen levels present during ensiling. A propionic acid-based stabilizer for total mixed rations can be used if heating occurs during feed out.